I made this elephant for my girlfriend's mom, who loves all things pachyderm. 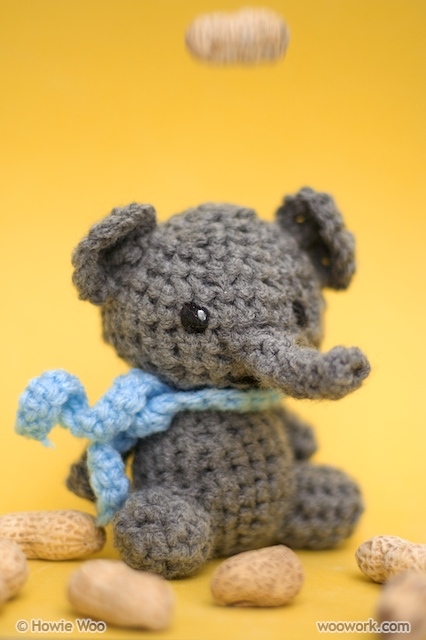 This elephant shares the same pattern as the green bear, but with a slightly different nose. A bonus to working on this blog is the chance to improve and share my photography. For this photo shoot, my girlfriend emptied a bag of peanuts onto the elephant as I snapped away. After a hundred photos, everyone and everything was covered in peanut dust. 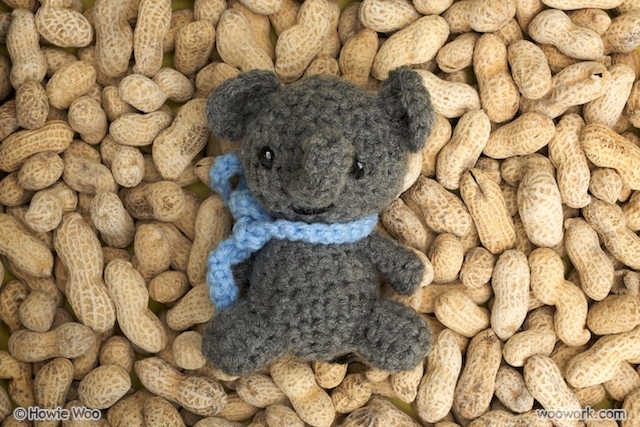 For the combination crochet/photography/food techies, this is the gear I used: a Red Heart 4mm crochet needle, a Canon Digital Rebel (EOS 350D) camera with a 50mm f/1.8 lens, and a 907g bag of The Produce Stand Salted Roasted Peanuts.